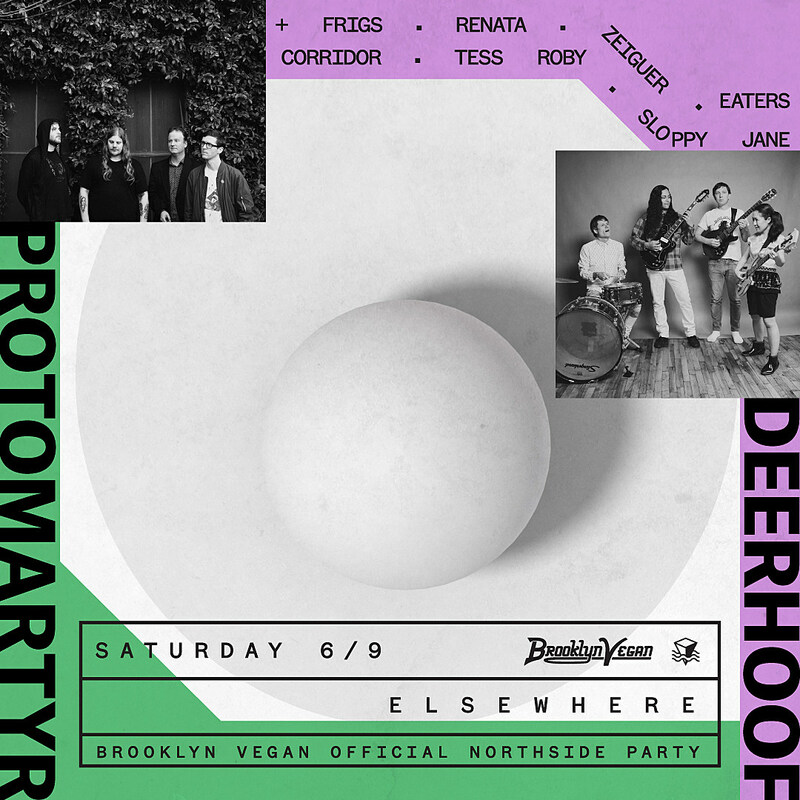 We’re talking over Elsewhere Hall and Zone One, plus the rooftop for this Northside Fest blowout featuring headliners Protomartyr and Deerhoof, plus The Frigs, Eaters, Sloppy Jane, Corridor, Tess Roby and more. The indoor shows require a ticket or a Northside badge, but the roof is free to all…based on capacity. Hope to see you there. 5:30 Doors. After switching it up from his folky style to a more soulful one, Nathaniel Rateliff (along with his backing band The Night Sweats) has significantly risen in fame. Tonight he headlines a pretty massive NYC venue, and the openers are two worthy acts who have a bit more in common with his previous folky style. Lo-fi pop artist Dear Nora has been called your favorite indie band’s favorite indie band, thanks to influencing such newer artists as Joyce Manor and Girlpool, and they recently released their first album in 12 years, Skulls Example, which is not a retread of their previous material but a step forward. Tonight, Dear Nora actually play with a member of Girlpool opening, Harmony Tividad. There are a lot of surf bands out there, but West Coast group La Luz bring great songs and a real sense of fun to party. After La Luz ticket around to see Shamir at this late-night Northside party. Quirky, orchestral indie rock vet Eels returned with new album The Deconstruction back in April and brings his gloomy grandeur to Brooklyn Steel tonight. Presented by LPR, this SummerStage show is an orchestral performance of David Bowie’s Blackstar, led by Evan Ziporyn and featuring solo cellist Maya Beiser, with a special performance by the Donny McCaslin Group, whose ensemble worked with Bowie on Blackstar. Philly’s Queen of Jeans will play a set before a short film program titled Love is Weird: Romantic Short Films. Brooklyn superior garage rock crew The Mystery Lights celebrate the release of their new single with a two-day celebration on OWL’s rooftop. This first day features a pretty killer lineup that includes Bodega, Montrreal’s Anemone, and tons more. 3 PM start. Parquet Courts kick off their weekend of “Air, Sea and Land” shows on the “land” at Lower East Side hotspot Public Arts. They play a boat on Sunday and Elsewhere’s roof on Monday…all three are sold out. NYC downtown post-punk legends Bush Tetras just put out their first album in years, and headline this Wharfcat Records showcase that features long-running noise-rockers Sediment Club and the Stooges-y trio Honey. Union Pool’s free Summer Thunder series is a great way to spend a Saturday afternoon and this week is a bunch of new local bands handpicked by Union Pool. It’s Capeshock’s Northside show, featuring all sorts of indie pop/rock, including Kyle Forester (Woods/Crystal Stilts), Jeanies (members of My Teenage Stride), Aussie ex-pats Free Time and more. Old Gray were supposed to headline this show but cancelled their tour. Fortunately, Cerce and I Kill Giants, both of whom were reuniting for this tour, are still playing. This is the Pitchfork Rising Northside showcase, and as the name implies, it features four artists that Pitchfork have done a ‘Rising’ profile on. There’s jazz/hip hop blenders Standing on the corner, rapper Chynna, neo-soul singer Madison McFerrin, and noise rockers Empath. Good stuff all around. This very interesting, multi-genre Northside showcase offers hip hop, metal, noise and more, and it looks like it should be a pretty cool night. Detroit experimental punk collective The Armed recently released their spastic, killer new album Only Love and this is their first NYC show since its release. Primal Rite are not to miss either.